In 2013 we augmented our hire stock massively with the dB Technologies DVA line array sound system, comprising of DVA T12 line array modules and S30N subwoofers. 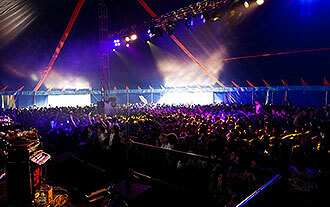 This fully active system is ready to handle events for up to 20,000 spectators utilising it's 150,000 RMS watts of power. This is a true sound system for the future - every speaker has built in 56-bit DSP processors to control parameters such as crossover, EQ, compression, time and phase alignment, with separate low-footprint powerful digital amplifiers for each driver. There's no longer a need to patch in huge outboard racks of amps and speaker management systems, eliminating fault finding time. All you have to do is link each speaker with a standard XLR, power lead and, for full control, Ethernet cables that connect to a computer via a USB DVA Network interface. All this along with the fact the units are hugely powerful but also very compact, lightweight and portable, make it a perfect system for touring and dry hire. 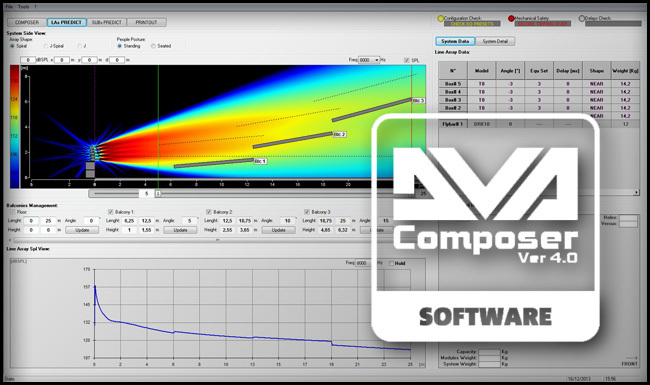 Using the manufacturer's bespoke line array system design software, DVA Composer, the system can easily be set up to provide perfect sound coverage across the entire listening space in any type of venue. With 8 DSP presets depending on array configuration for simple setup and even a customisable preset, you can store your own settings inside the unit and automatically recall them next time it's switched on. All DVA range speakers have built in active multiband, RMS and thermal limiters, making it virtually impossible to damage the drivers and amplifiers. 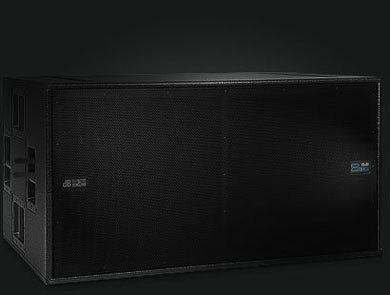 Each subwoofer and speaker module has dual power supplies, meaning no audio downtime, so you can rest assured these will deliver in level and reliability even when pushed to their hardest. All this ground-breaking technology and astonishing ease of use make them suitable for dry hire with minimal knowledge or training. We also have fully trained and professional sound engineers available to transport, set up and operate any sized system worldwide. Training in this system can also be provided for you and your staff if needed. With every DVA system supplied by us you get access to one of the most advanced pieces of line array prediction software available. It will design line array configurations for you based on the equipment and venue dimensions supplied to get the best coverage possible in any type of location, taking into account slopes, balconies, walls and ceilings. It also gives you a clear visualisation of SPL levels at any point in the listening field over different bandwidths. 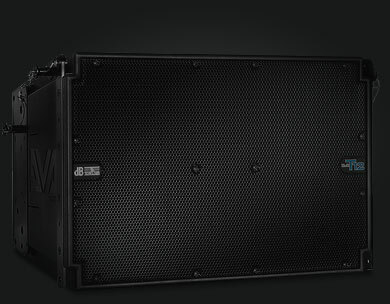 All you have to do is set up your line array modules using the angles provided and your speakers are ready to fly. DVA Network (formely RDNet) is a networking protocol designed by engineers at RCF and shared with dB Technologies after the companies merged. It makes it possible to monitor all the system parameters, from the input level to the status of each single amplifier including its actual temperature, warnings and error logs. 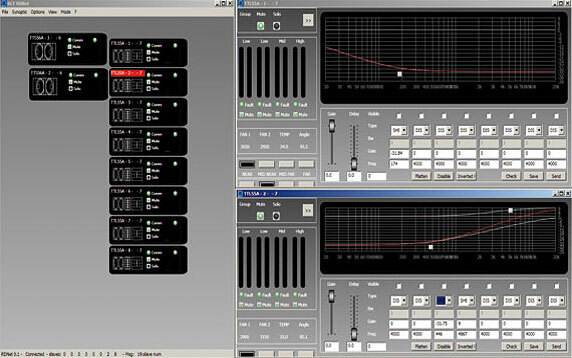 Having a DSP processor on board of each cabinet, it is possible to set single cabinets or groups of cabinet's specific presets or custom parameters such as gain, EQ or delay. The DVA Network protocol is based on RS-485 communication protocol, it is very stable and it is possible to send and receive data over a single XLR cable. With all the parameters being stored internally in the cabinet, if there is any break in connection the sound will not be affected and the speakers will store these settings until next plugged in. Maximum reliability. Please see the recommended packages below. These are for informative purposes only and can be tailored to your specific needs. 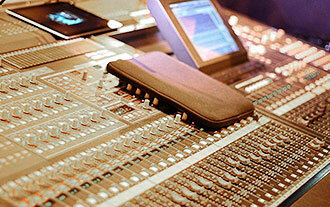 All packages include 2 x DRK20 flying frames, an DVA Network control box and set of audio, control and power cables. 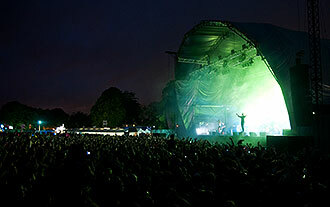 The above packages can be hired separately, or for larger events, multiple could be used. 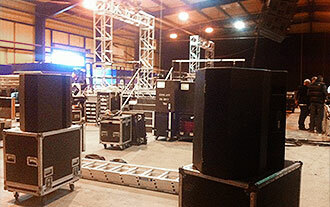 This is not an extensive list of our hire stock, any sized event can be catered for. All prices are based on a dry hire for 24 hours, subject to availability. E&OE. For more information or to discuss your specific requirements do not hesitate to contact us on 0161 238 8727 ext 2 or email us at info@soundbasesolutions.com.